People passing by a Holland & Barrett store in England. Holland & Barrett has launched Britain’s first ‘free from’ concept store, seeking to tap in to the fast-growing market serving people who suffer from food intolerance or allergies. The new store in Chester, northwest England, is the first of 50 Holland & Barrett More outlets planned for the next two years, stocking 700-plus products free of ingredients such as gluten, nuts and eggs among others. 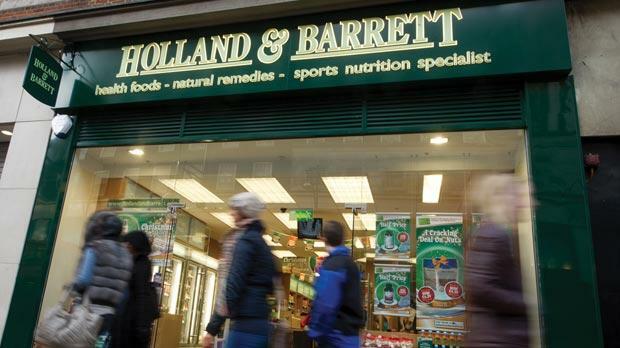 Holland & Barrett, the British arm of US nutritional supplements and wellness products company NBTY, already trades from more than 620 outlets across the UK and Ireland and is aiming to become Britain’s largest ‘free from’ retailer. The company’s website will initially offer 1,000 products, expanding to more than 3,000 by the end of the year, covering all of the main ‘free from’ categories. Research company Mintel says the British market for such products doubled in value from 2009 to reach €512 million last year and is forecast to grow by a further 50 per cent by 2019. Rival researcher YouGov said that a 2014 survey found that 22 per cent of people in the UK consider themselves to have a food allergy or intolerance, up five per cent since a 2011 survey. “The speed of growth of ‘free from’ has seen it transform from what was once regarded as a nutritional niche into a mainstream shopping option,” NBTY’s European CEO Peter Aldis said.